I have ID'ed many other insects with BugGuide, thanks everyone. 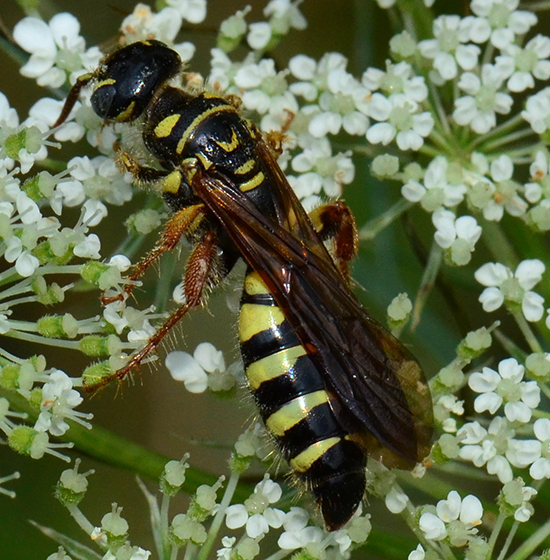 This insect was foraging on Queen Ann's Lace. Perhaps this is a Scollid but I can't find a reasonable match. The hairy legs, stubby dark antenna and color pattern together stump me. Are these the same individual? Wow that was fast. And (slaps forehead) I already had a male 5 banded Tiphiid. I am working through many thousands of my photos trying name and learn. Thanks again for the great resource. So pardon the belated, "Welcome to BugGuide!"